A number of different Coppice products are used for thatching roofs. Spars are short lengths (27″- 30″) of cleft hazel that are used by thatcher’s to secure the layers of straw or reed. Pointed at both ends they are twisted and used as a pronged peg to hold the thatch. Pre-twisted spars are quicker to use and favoured by some thatcher’s which also allows UK sourced spars to be used all year round. 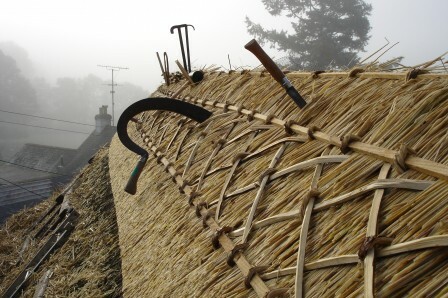 Liggers are split hazel of various lengths which are used to hold the outer layer of thatch down near the top and often laid in a decorative pattern. Sways are long lengths of hazel or willow laid horizontally under the thatch to hold each course of thatch in place. Gadds are lengths of hazel in the round which are split to produce spars or liggers. Gadds are referred to as 4’s, 6’s, 8’s etc which denotes the number of spars split from a single gadd.